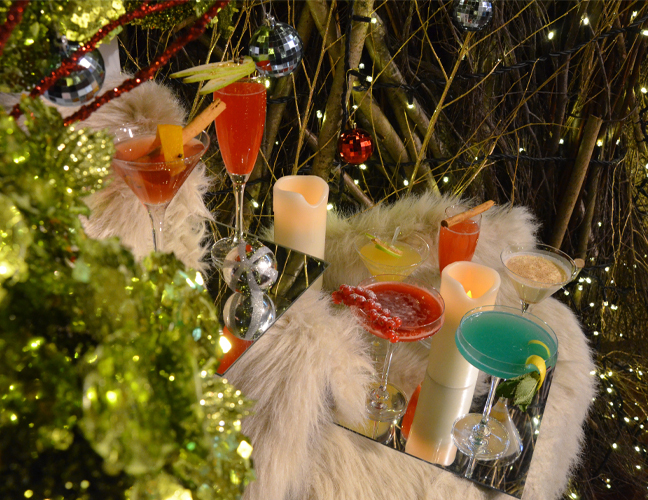 Harvey Nichols fifth floor bar elves have created a festive cocktail list, inspired by there favourite Christmas films. Muddled winter fruits with Chase Marmalade, cinnamon syrup and topped with HN Rose Champagne. Sipsmith Sloe Gin, crushed pear and cloves, topped with HN Brut Champagne. Plum vodka, Amaretto, Mozart Chocolate Liqueur and fresh cream. This cocktail certainly packs a punch! Williams Gin, Quince Jelly, lemon juice, pear nectar and Kings Ginger Liqueur. This list can be enjoyed all day every day; so whether you are seeking some respite for your weary pins, following a glorious shopping day, or whether your seeking to party the night away pre dinner the bar provides a warm winter welcome.